Sleeping Bag – Women Of Your Life | NoCoda. What It Sounds Like: Deadpan delivery and effortless indie guitar rock melodies combine to to sound like Weezer’s little brother. You’ve never heard a singer quite like Dave Segedy before. Remember that guy in high school who graduated, but never left town, and just sat around smoking pot all day? The guy who still probably sells tickets at the local movie theater and has been kicked out of his parents basement about five times, but still manages to keep coming back? Not in actuality, of course, but it would make for a fitting fictional back story, as he has about as much of a slacker mentality in his vocal delivery as you could even begin to wrap your head around. 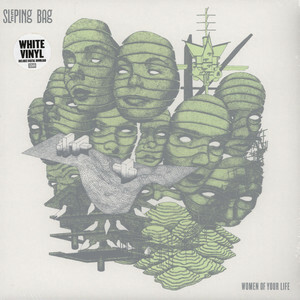 But, that’s the secret to Sleeping Bag’s success on their slightly spiced up sophomore record, Women Of Your Life. You think he sounds bland here? Check out their self titled debut record from two-thousand-eleven. That Dave was failing even more classes than this Dave is! Even that being said, these tracks are infectious and snarky in the best way possible. Who can’t appreciate the wordplay of naming a track Soda You, but using it as so do you? You’re a peach / I’m a prince evolved into a soccer ball / And they’re kicking towards the right and they’re kicking towards the right / Out by the mall he sleepily sings on Soccer Ball, which almost sounds like it could be played at an island beach bar that refuses to spin anything by The Beach Boys. Allison Cole doesn’t even hit two-minutes, but leaves its mark with its straight ahead indie rock stride, leaning heavily on the cymbals and the couple random chords that are speeding by. You’ve heard songs before written about girls like this right? You know how they sound: Ashley Mae, Suzy Jones, or Caitlin Page. Happy and full-bodied. These aren’t anthems. They’re not trying to be grand. How huge would you really want a song like Nightmare to sound anyway? You don’t need ten layers of guitar or five minutes of length; you simply need it to bounce along with its slick lead guitar line and haphazard drums that sound like a lesson more than a song… I love it! That little breakdown a minute-and-twenty-seconds in just makes me smile. It’s so simple, and that’s the beauty of it: everyone overcomplicates things these days and tries to always sound bigger and badder. Sure, some tracks like Still Life get monotonous because they simply lack any form of energy, but those instances are few and far between. For the most part, this is just super simple jagged indie-rock done well.